VANCOUVER, BRITISH COLUMBIA--(Marketwire - Dec. 24, 2009) - Kodiak Exploration Limited (TSX VENTURE:KXL)(FRANKFURT:KX3) is pleased to announce the completion of 667 line kilometres of ZTEM survey carried out by Geotech Ltd. that cover portions of the McTavish option at the company's West Millennium uranium project in the Athabasca Basin of northern Saskatchewan. The ZTEM survey identified two previously unrecognized conductors on the McTavish option that have a total strike length in excess of seven kilometres (E-1 and E-2, see accompanying map). The conductors are located in the un-explored west central portion of the McTavish ground which is under option from CanAlaska Uranium Ltd. The conductors are arcuate features with coincident magnetic contrasts and may represent prominent Archean granitic domes flanked by graphitic-rich metasediments. This geological setting resembles that found at the Key Lake and the McLean Lake uranium deposits and underscores the excellent exploration potential of this portion of the West Millennium project. Kodiak is planning ground geophysical surveys over these new conductor targets in preparation for future drill testing. Kodiak will also continue drill testing the high priority D-1 graphitic conductor system where previous drilling returned very encouraging results: 0.13% U3O8 in previously announced drill hole WM09-04. The D-1 conductor exhibits strong chlorite and grey clay alteration with local mylonite and fault gouge; overlying sandstone is bleached and unusually hematitic. Kodiak is planning approximately 6,000 metres of drilling to further test the D-1 conductor and identify higher grade portions of this robust uranium mineralized system. Cameco's recent announcement of the discovery of "significant uranium mineralization" in basement rocks situated along the B-1 conductor trend just two kilometers south of the Millennium deposit near the Kodiak claim boundary further highlights the intensity of the uranium mineralization in this portion of the Athabasca Basin. Drilling is tentatively scheduled to begin in February 2010. Hercules Update: The resource estimation process has begun and initial field visit completed by the third party qualified person. Ice making is in progress on "Golden Pond" in the western segment of the Golden Mile vein system in preparation for winter drilling. 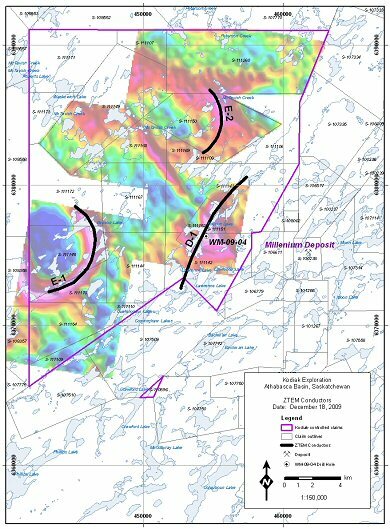 Further updates on Kodiak's winter exploration plans for the Milestone, West Geraldton and other projects in the Beardmore-Geraldton gold camp will be forthcoming. Kodiak is a mineral exploration company with properties located in Canada. You can view additional maps, photographs and additional information, on our Web site: www.kodiakexp.com. The geological information in this press release has been reviewed and approved by Keith Metcalfe, Chief Geologist-Energy Division, who is a qualified person under the definitions established by National Instrument 43-101.